For many people December is the most difficult time of the year. Memories of past celebrations with family members and friends who are no longer here can magnify feelings of loss. You may feel especially vulnerable and you may want to pay more attention to self-care. 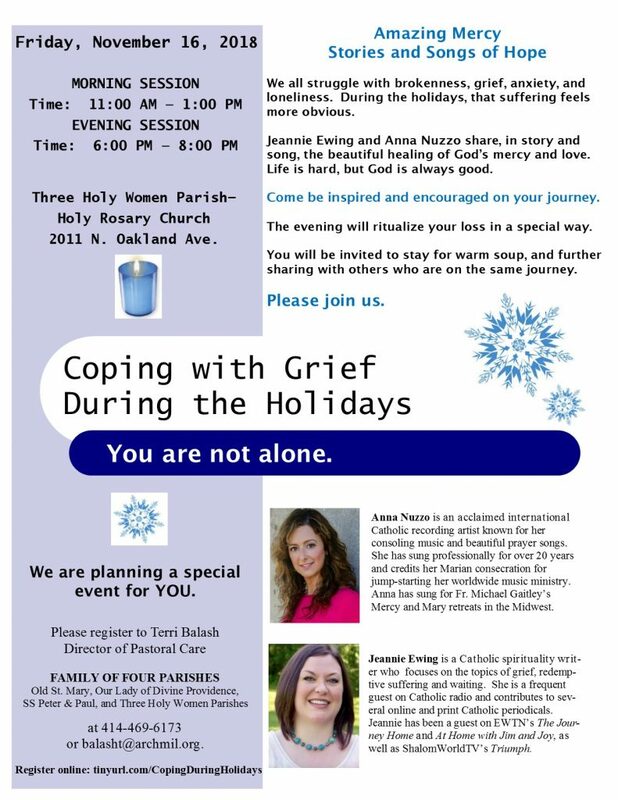 Coping with Grief during the Holidays is the perfect way to care for oneself and honor the person who has died. This gathering is all about caring for you, through music, story, and ritual. We are excited to welcome Jeannie Ewing and Anna Nuzzo, who will share the beautiful healing of God’s mercy and love. Life is hard, but God is always good. Come be inspired and encouraged on your journey. This gathering will ritualize your loss in a special way. You will be invited to stay for warm soup and further sharing with others who are on the same journey. Please join us and invite someone who could use a little help in this area. Registration can be found at tinyurl.com/CopingDuringHolidays. You may also register directly with Terri Balash, Director of Pastoral care, at balasht@archmil.org or 414-469-6173.